Our survey department has a broad base of experience on topographic, boundary, hydro-graphic, roadway, levee, coastal marsh and other types of surveys. Our survey data is obtained using electronic total stations/data collector sets, Real Time Kinematic (RTK) GPS systems, conventional levels and hydro-graphic (Fathometer) equipment. Data is typically saved in electronic files for direct download into Auto-CAD, Micro-Station or other mapping software. Survey projects are carefully planned to utilize proper vertical benchmarks, horizontal reference marks and appropriate datum. GOTECH, Inc. surveyed the New Orleans to Venice levee project named City Price to Tropical Bend Levee Project. This project supported the final construction plans and design specification of the "back levees", which are hurricane protection levees built on the Gulf of Mexico side of developed areas along Louisiana Highway 23, located south of New Orleans. GOTECH conducted the topographic and cross section survey, which encompassed over 12 1/2 miles of back levee. The Corp implemented the design and construction of a hurricane protection levee system across Southeastern Louisiana. One key element in the levee system is the provision for ship traffic along the Houma Navigation Canal in Terrebonne Parish. A lock and floodgate structure is planned for that area of the levee south of Houma near the community of Dulac. GOTECH, Inc. survey crews worked continuously to provide a full contour map of the seven hundred acre site. Hydro-graphic channel surveys, spoil bank surveys, marsh surveys, cross sections, level loops and baseline traverses were all conducted in accordance with the required Corps accuracy standards. An existing Corps baseline was recovered and verified against the published baseline tabulation. A new sub-baseline was established and monumented on the West Bank of the channel for use in the future construction efforts. GOTECH AutoCad technicians processed the field data and produced a plan view map for the entire site. The mapping sheets showed the bank lines, channels, spoil areas, marsh regional and contours across the area. GOTECH conducted the topographic, elevation and utility survey for the 5 mile long I-10 corridor between LA Hwy 73 and LA Hwy 22 in Ascension Parish. The project involved the widening of I-10 from a 4 lane freeway section to a 6 lane freeway section. GOTECH survey personnel tied into control points provided by the Louisiana DOTD and used the horizontal and vertical data as the basis for the survey. GOTECH surveyed the right-of-way limits so that the existing center-line could be established. Cross sections were surveyed at 100 foot intervals from 65’ inside the inner shoulder to 50’ beyond the other shoulder on both the eastbound and west bound travel lanes. GOTECH also surveyed utility line markings and test holes for items such as water lines, gas lines, electrical lines, pipelines and fiber optic lines. Information was also obtained in the field for bridges, such as project stationing for bent center-lines, joint openings, elevations of slab corners, elevations of bent tops, piling size and location, column size and bridge geometry. Additionally, all topographic features in the project area were surveyed. GOTECH provided surveying and mapping for the Union Passenger Terminal (UPT) and Rail Yard Project in New Orleans, Louisiana. The 35 acre site was divided into Task 3 (Amtrak Yard), Task 4 (UPT Lead Track and Clara Interlocking Improvements) and Task 5 (UPT Platform Tracks and Platform Improvements). GOTECH provided cross section elevations and data on topographic features (rails, switches, frogs, ties, ballast, structures, buildings, drains, fences, joints and signs). Working as a sub-consultant, GOTECH, Inc. was responsible for the survey of sewer manholes across the city. Approximately 1,500 manholes were surveyed to determine the x, y and z coordinates of the rim and the depth of the manhole. The data was used by others on the modeling phase of the project. The manhole surveys were tied to the city of Shreveport’s monument control datum system. LA Hwy 1 at the Caminada Bay Bridge in Grand Isle and the realignment of LA 1040 in Tangipahoa Parish, LA. For the LA DOTD, GOTECH provided survey services on the Interstate 12 to Bush, LA Project. The survey work will serve as the basis for a new roadway design connecting the I-12 corridor with roadways to the northeast and southern Mississippi. The total project area extends over 18 miles in length. Cross sections and topographic data were surveyed along the proposed alignment in heavily wooded areas and along an abandoned railroad bed. GOTECH provided elevation data along the route and surveyed details at intersections with existing highways. The project area was divided into 3 design segments and GOTECH provided survey data on all 3 segments, with surveys covering over 12 miles of the project. This project extended for a distance of approximately 25,000 feet (4 ½ miles) along the eastern edge of Ascension Parish in the Amite River Basin. The project required a baseline survey with P.I.’s set in the field. GOTECH surveyed 400 foot wide cross sections every 500 feet along the levee route. Two detailed topographic surveys were also conducted at a future structure site and at the northern end of the levee. GOTECH coordinated with the design engineer to provide the data suitable for further mapping and design activities. GOTECH also provided right-of-way surveying services on the project. Boundary surveys were conducted on approximately 30 parcels to identify land areas required for the levee construction. Working as a sub-consultant to AECOM, GOTECH provided surveying and mapping services at the Port of New Orleans. 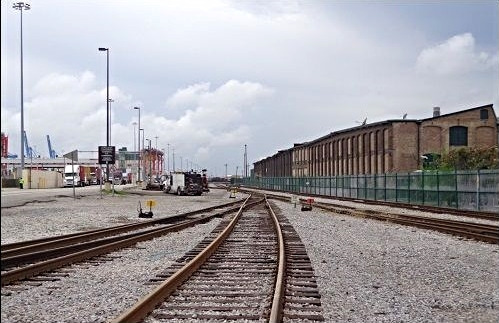 GOTECH field crews conducted a topographic survey of a 12 acre rail yard between the Napoleon Avenue commerce terminal and the Louisiana Avenue terminal. GOTECH also surveyed the Clarence Henry truck way in the project area and at the Napoleon Avenue intersection. For the mapping services, GOTECH provided a plan view topographic map and a digital terrain model (DTM) for ground contours.